This error occurs mainly if your .aspx page, html tags are not closed properly or you have Bad Html tags which could lead to Html Parser error. Example: I was playing with FreeTextBox, in Html mode. Suddenly a Phone rangup and forget to close Html tag inside FreeTextbox. Remove Bad Html or rectify Bad Html part from your .aspx page and this error would get resolved. Earlier I have discuss about how to post tweet from asp.net web application. In this article I would discuss how to post google buzz from asp.net web application. Google Buzz is Twitter like service from google, inside gmail. Following Procedure explains how to send google buzz from asp.net website without using google buzz api. Step 1: As Google Buzz require a valid gmail account. You need to decide, from which gmail account you would like to post google buzz. For this example, i would be posting google buzz from my gmail account. i.e. dotnetguts [at the rate] gmail [dot] com. 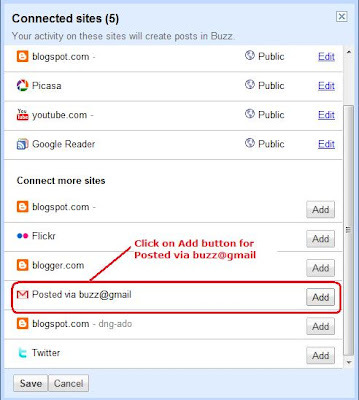 Step 2: Enable Google Buzz posting by sending email. Please follow following to do so. a) Log into your gmail account. c) Click on Connected Sites link as shown in figure. d) Click on Add button associated with "Post via buzz@gmail"
e) Click on save button. Step 3: Open Visual Studio and create new asp.net website. Step 4: Arrange web control as shown in following figure. Step 5: Call following Function from Button Click Event. //Create Mail Message Object with content that you want to send with mail. //get it from respective server. Step 6: Run asp.net website and Send Message. Now Check your Buzz to see how message appears.